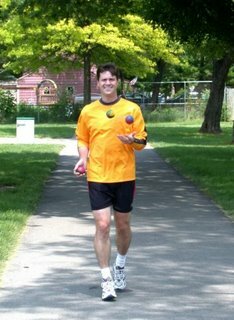 Joggling is a sport created by combining the activities of jogging (or running) with juggling. Early attempts to call it Ruggling were not well accepted and Joggling is what stuck. It has probably been in existence for as long as juggling itself, but the term wasnâ€™t really coined until the early 1980s. No single person can really take claim to inventing it. Albert Lucas was the first person I ever read about who joggled a marathon. The most common form of joggling involves running forward while maintaining a 3-ball cascade pattern. This is a sideways figure eight or infinity sign pattern. You can learn to juggle (or joggle) by going here. Most competitive jogglers use bean bags as their juggling equipment but this varies depending on personal preference. Some use tennis balls, rubber chickens, juggling pins, basketballs and even machetes. Iâ€™m currently using a cube bean bag set that is produced by Juggle Bug. There are also some specially designed Exerballs produced by Brian Dube for joggling. Iâ€™ve never tried them as my Juggle Bug cubes have worked well so far. For a long time I also used a set of bean bags from More Balls than Most. They were a little heavier than my current set so they worked a bit better in the wind. Unfortunately, for long distance joggling, a heavier set is less desirable because they extra weight gets tiring over many hours. It has been suggested that there are about 800 jogglers in the United States. They can most frequently be found at events sponsored by the International Jugglers Association (IJA). Each year this group holds joggling competitions in standard track events like the 100 M, 200 M, mile, hurdles etc. The records for such events are quite impressive even by running standards. The running speed of talented jogglers seems almost unaffected by the juggling. Some have suggested about a 10% drop in speed. For me it’s not nearly that much. I don’t think I could actually run much faster whether I’m joggling or just running. To see some of the records and read a bit more about joggling, check out the wikipedia entry here.